Roger Federer (1981–) is widely regarded as one of the greatest tennis players of all time. To date, he has won a record 20 Grand Slam men's singles titles, and has been Wimbledon Champion eight times. In 2018, he also became the oldest number one tennis player in history, at the age of 36. Find out more about this gracious and talented man and how he has stayed at the top of his game for so long, and then enjoy our collection of printables and worksheets with the kids! As a child, Federer spoke Swiss-German, but he is also fluent in German, French and English. Federer’s wife, Marka Vavrinec, used to be a professional Swiss tennis player. The couple met at the Sydney Olympics in 2000. Federer was ranked number 1 at three consecutive Olympic Games (Athens 2004, Beijing 2008 and London 2012). Roger Federer was born in Basel, Switzerland, in 1981 where he grew up with his parents and his older sister, Diana. Their Swiss father Robert and South African mother Lynette had met on a business trip, while both working for a pharmaceutical company. Federer enjoyed badminton, basketball, tennis and football as a child. He was just four years old when Boris Becker won his first Wimbledon Championship in 1985, and began playing tennis himself aged eight. Federer became a huge fan of Becker and the Swedish player Stefan Edberg while he was growing up. By 11, Federer had become one of Switzerland’s best junior tennis players. He began focusing solely on tennis and practised hard. By 14, he was the country’s national junior tennis champion and was asked to train at the Swiss National Tennis Centre in Ecublens. This meant living away from his parents during the week. The training centre was also in the French-speaking part of Switzerland (Federer was used to speaking German at home). It was difficult for him at this young age, but he stayed for three years, and was granted sponsorship at just 16. His hard work and perseverance also paid off when he won the junior Wimbledon singles and doubles title aged 16, and was recognised by the International Tennis Federation as the World Junior Tennis Champion of the Year (1998). Federer is famous for his excellent sportsmanship and cool conduct on court, but it wasn’t always this way. During his younger days, he would often get frustrated with himself on court – much to his parent’s disapproval! Thankfully, Peter Carter, his Australian coach of many years, helped Federer to develop an almost flawless technique and taught him much about being gracious and polite on court. Federer came to worldwide attention in 2001 when he beat the reigning Wimbledon champion, Pete Sampras, in the fourth round of the tournament. By 2003, Federer was Wimbledon champion himself – becoming the first Swiss man to win a Grand Slam singles title. The following year, he regained his Wimbledon title and also won the Australian Open, the US Open and the ATP Masters tournament. He was undoubtedly the world’s number one player, but his reign at the top was just beginning. Federer’s brilliant all-round play on a variety of surfaces has helped him to stay in the top rankings for over a decade. His power overwhelms most opponents, but he also uses players’ weaknesses to his advantage. By 2018, he had spent 700 weeks (13.4 years) as one of the world’s top four male tennis players. Federer's career hasn’t been without setbacks. In 2013 he was knocked out in only the second round of Wimbledon by the 116th seed, and in 2016, he withdrew from the French Open due to a back injury. But Federer’s perseverance means he just comes back stronger. After six months recuperating in 2016, for example, he returned with a stunning win at the Australian Open – his 18th Grand Slam title. Off court, Federer is a busy man. In 2003, he set up the Roger Federer Foundation to support sports and education projects in Africa. He also spends as much of his spare time as possible with friends and family. He married Mirka Vavrinec in 2009, and they are now parents of two sets of identical twins – Myla and Charlene (born 2009) and Leo and Lenny (born 2014). Federer and his family live on the shores of Lake Zurich, Switzerland. His parents conveniently live in the house next door! Learning to draw top tennis player Roger Federer should be a lot easier with the help of our handy step-by-step instructions. Our famous people booklets are a fun and different way for kids to record and present their work. This one is for superstar tennis player Roger Federer. You'll need our booklet folding instructions found here. The kids may have already heard of the famous tennis player Roger Federer, and they can learn a little bit more about him by reading our helpful fact sheet. Roger Federer has won 20 Grand Slam titles and his career is still going strong. If you had the chance to interview him, you might want to ask how he did it? Think of some other questions too and write them down in the speech bubbles on this interview worksheet. Maybe the kids will write about one of Roger Federer's fantastic Grand Slam wins on this newspaper writing prompt? Tennis player Roger Federer has had a remarkable career so far, and he's not finished yet! Can the kids fill in the important events in his life up to this point? 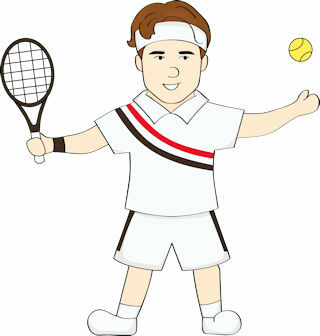 Here's a simple worksheet all about tennis superstar Roger Federer, available in colour or black and white. 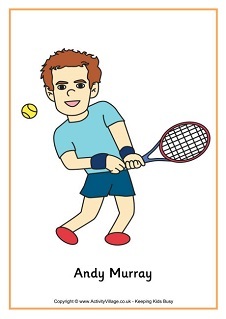 Our writing pages are a great way to encourage children to research and write about famous people - in this case, tennis ace Roger Federer.